HS-1 SL is now stocked nation wide at all W. R. MEADOWS locations. HS-1 SL is a one-part self-leveling hybrid polymer sealant developed using SMP technology designed for horizontal expansion joints in swimming pool decks, patios, and sidewalks. posted with permission of the publisher, Hanley Wood, LLC. 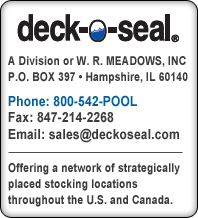 Need to identify the best DECK-O-SEAL sealer for your pool deck project? Check out our standard sealer chart and our water-based sealer chart. This tri-fold lists the complete line of DECK-O-SEAL products, including our namesake sealants, plus or high quality curing and sealing compounds and accessory products. Order this tri-fold to learn more about our wide line of products, or to give out at your store location. This tri-fold explains our three-step program to prepare a surface for the application of our concrete deck sealing system, which incorporates the use of DECK-O-GRIP and DECK-O-SHIELD. Order this tri-fold to learn more about this system, or to give out at your store location. This tri-fold lists the complete line of curing and sealing products that will protect your pool deck for years to come. Our new full line brochure covers the entire family of DECK-O-SEAL products, including our joint sealants, curing and sealing compounds, and expansion joint materials. The brochure also includes full color application photos, specific product information, and a guide to mix our DECK-O-SEAL product. This brochure covers the W. R. MEADOWS family of companies, including W. R. MEADOWS, DECK-O-SEAL, HUEBERT FIBERBOARD, and BLUE RIDGE FIBERBOARD. Included in this brochure is background information on W. R. MEADOWS, including new product innovations throughout the years, company expansion, and information on the Meadows family. Since 1926, W. R. MEADOWS has been a leader in the construction industry, and this brochure will inform you of our experience and expertise. Order Literature, or click images below for PDF versions.